Revolutionary treatment from a US company can significantly restore vision to those suffering from end-stage dry age-related macular degeneration (AMD). Manchester Royal Eye Hospital (MREH) has become the first NHS hospital in the UK to offer the CentraSight treatment programme for end-stage age-related macular degeneration (AMD). As part of the treatment programme, CentraSight’s proprietary tiny telescope implant is placed in the eye via an operation similar to a cataract operation. The CentraSight implant is the only FDA- and CE-approved treatment option for end-stage AMD and has been used in over 600 cases worldwide. The treatment is offered at over 120 centres in the USA and is Medicare-eligible. In the UK, besides Manchester Royal Eye Hospital (MREH), it is only available in private hospitals. 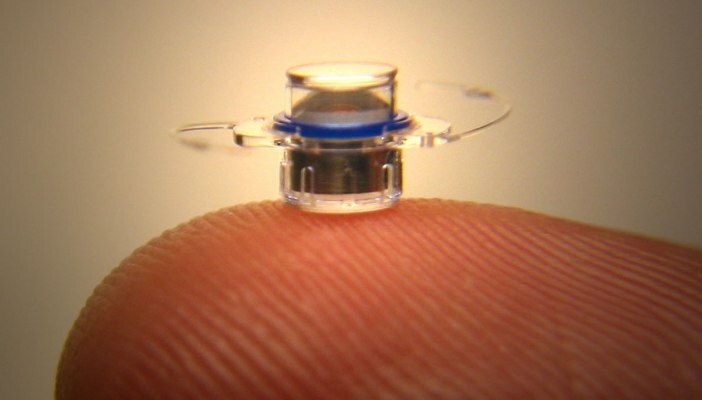 Smaller than a pea, the implant uses a unique, micro-optical technology to magnify images approximately three times. The images are projected onto the healthy part of the retina, making it possible to again use the central vision we rely on to recognise faces and see objects in front of us. MREH is the second largest eye hospital in the UK and has, for over 200 years, been at the forefront of ophthalmic care. MREH joins a network of world-leading eye hospitals offering the CentraSight treatment, including, Emory, UC Davis, Mayo Clinic and Johns Hopkins Hospital, all in the US. AMD is the most common cause of sight loss in the developed world. There is no cure for it and it cannot be corrected by glasses, drugs or cataract surgery. More than 600,000 people in the UK are living with its life-changing effects. It attacks the sensitive part of the back of the eye responsible for central, detailed vision. The result is a central “blind spot” and generally blurred sight that makes recognising faces and daily activities difficult, if not impossible. The CentraSight telescope implant has been shown to improve vision and quality of life in patients with dry end-stage AMD, the most advanced form of AMD in which individuals have lost central vision in both eyes. CentraSight employs an extensive pre-screening process to select the most appropriate patients for the treatment. Cathy Yelf, Chief Executive of the Macular Society, said: “It’s good news that this new lens implant will be available to some patients at an NHS hospital. Studies suggest it can improve vision and therefore for those few who qualify for the treatment, it should help improve their quality of life and enable them to cope with day to day activities. A key benefit of the CentraSight treatment programme is its comprehensive support for patients before, during and after the procedure. Medical, visual and functional evaluation of prospective patients ensures that the treatment is right for them and CentraSight can even simulate what a person can expect to see once the telescope is implanted. The procedure itself is well tolerated with minimal discomfort, takes about an hour and patients can go home the same day. In the months following the treatment, patients work with specially trained low vision specialists to learn how to use their new vision. The CentraSight telescope is approved by the FDA (the U.S. Food and Drug Administration) and is CE-Marked for clinical use in Europe. A five-year clinical study published in 2015 has demonstrated the long-term improvement in vision that the CentraSight telescope gives patients. CentraSight employs an extensive pre-screening process to select the most appropriate patients for the treatment. People living with end-stage AMD or their families can find out more information about the technology and treatment programme and help determine if it could help them by calling CentraSight on 0800 002 9998.